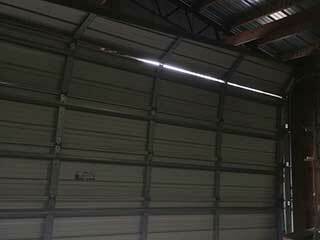 Garage door cables are integral parts of your spring system, responsible for counterbalancing and lifting the door. They always come in pairs and are installed on both sides of the door. In case of a torsion spring system, which is becoming increasingly common, these components go over the drum on each side of the spring and are fixed to the bottom end of the door. These components are generally designed to be very strong and durable, but sometimes things can go wrong - read on to learn more. When the door opens, the torsion spring unwinds and releases force which gets applied to the drums and then to the cables. During this motion, these components are under a lot of tension. As a result, they have a fairly high rate of wearing over time. You can notice fraying easily - the cables become noisier when this starts to happen. It is fairly common for cables to acquire tiny cuts. These usually occur due to imperfections with the drums, which the cables pass over regularly. Even a tiny cut over time can increase the risk of a cable breaking. This is why you should check for damage regularly as part of your regular maintenance schedule. If your cable breaks completely, you will notice this as soon as you try to open the garage door. It will become jammed and likely appear uneven too. It's likely you will also see the top section of the broken cable hanging from the drum. In this situation, there's no fixing the broken cable - you'll need a replacement. This problem doesn’t occur very often - when it does, it's usually because the cable has jumped off the drum due to a torsion spring snapping. First, you'll need to get your spring replaced, then have the cable adjusted to its normal position - it's unlikely you'll need to replace the cable in this instance unless it's significantly worn. We can help with all these problems - if you're after maintenance or repair services for your cables, just get in touch with our team at Garage Door Repair Shelton in Connecticut!